Titanic Belfast is in line for 832,000 visitors in 2018 after attracting its five millionth visitor, Rita Lynch, and its busiest first two quarters of a year. 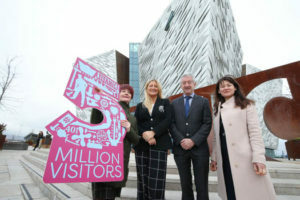 Numbers visiting the Belfast attraction rose by 8pc on last year this spring and summer, specifically from international markets, including North America, mainland Europe and China. Rita Lynch, who is from Sligo, had travelled to Belfast for the first time since 1983 specifically to experience Titanic Belfast. Opened in 2012, Titanic Belfast’s visitor numbers rose from 596,777 in 2013 to 771,038 in 2017 (the TourismNI Ireland figure for Titanic in 2017 was 760,362). Number dipped between 2014 and 2015 from 644,792 to 621,521. Titanic claims the centre generates £160m in additional tourism spend for the economy.